There are also other indications: bus announcements translated into English, overweight people, loud families, etc. But the “approach a stranger, strike up a conversation out of mid-air, attempt to get digits” number is a particularly good indication that some new blood is on the streets. I’ve generally heard that it takes guts for a guy to approach a woman and try to create a connection out of nothing, and therefore you should respect the effort. I generally disagree. Guys who have this approach are either outgoing, confident, or desperate (or drunk, or under a dare). If they are outgoing or confident, then it’s not a particularly brave action. If they are desperate, they are driven beyond their own gutsiness. Still, I usually enjoy these sorts of encounters if they are non threatening/non physical. My friends roll their eyes or ignore unsolicited male attention, and find it odd/amusing when I engage in the conversation. I find the whole process fascinating. It’s like we’re all these amoebae floating around the world, and generally ignoring the ones we don’t recognize. Then, suddenly, one of them likes the outline or nucleus of another, and angles its direction to bump into it. Maybe that was a weird analogy. 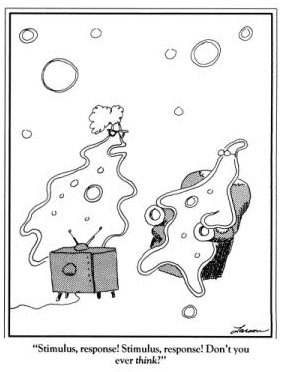 I first imagined it as disembodied souls, but the amoeba image had more of a Larsonesque feel to it. Suffice it to say, I enjoy interacting with (non creepy) strangers. I was a journalism major. I want to meet people and hear their stories and try to figure out what set of circumstances, genetics, personality type, serendipitous happenings, led them to who and where they are at that exact moment. And no, I don’t think everyone is good deep down. But a lot of people want to be, and that’s a start. Yes, those last two sentences were contextually appropriate. It’s also a great acting exercise. A stranger hitting on you might be attempting to simulate a genuine conversation, but there is no obligation to treat it as such. You can change your name, age, occupation – heck, you can go to that exclusive college that rejected you and you pretended not to care, calling it elitist and bourgeois, while secretly you wish you’d gotten in. *Use an accent that you can maintain.